Two people participate in an intense bonding experience which ultimately turns out to have a limited shelf life. That notion – the ephemeral nature of human connection – is made especially poignant in the haunting The End of the Tour, which posits that embracing the moment may be the most solid option in life. 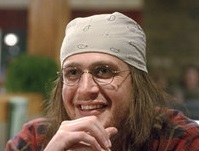 Directed by James Ponsoldt, the film, based on true events, is literally about the tail end of the book tour commandeered by David Foster Wallace (Jason Segal), who was promoting his new novel Infinite Jest in 1996. Back in New York, journalist David Lipsky (Jesse Eisenberg) – a newly published novelist himself – concedes that Wallace’s writing measures up to the hype. In short order, Lipsky gets a green light from his editor at Rolling Stone to profile Wallace in Minneapolis. Lipsky’s physicality – slender, taut and cunning – strongly contrasts with the gentle, bandana’d Wallace, whose layered garments create the look of a fleshy-torso’d frame, as though to protect his delicate psyche from perishing in the cold. Outwardly Wallace is as looming as his doorstop of a book, as he quietly galumphs about his business. If Lipsky is precise – he’s a journalist, after all – then Wallace, like his two dogs who irritatingly invade open-door rooms at will, seems impervious to boundaries. Both men are in their earlier thirties, and each yearns – not so subtly and more like archetypal Mars adversaries – for an aspect of the other’s life. Lipsky is highly attuned to Wallace’s growing fame and critical acclaim. Wallace, who has no girlfriend, is highly aware Lipsky has a significant other and possesses a sexual dynamism. Each, in his own way, wonders competitively who is the better man. During this five-day period, Lipsky has taken up Wallace’s offer of hospitality, and the fragility of trust is on full display. The author wants to be open, despite his entreaties to Lipsky to keep certain personal information out of the article; the reporter wants to be objective, which means digging and confrontation. Lipsky never published his article. 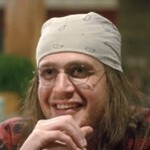 However, his interview tapes do became the foundation of Although Of Course You End Up Becoming Yourself: A Road Trip with David Foster Wallace, published after Wallace’s suicide in 2008, which Lipsky learned about online. It’s as though Wallace – privy to secrets about relationships that Lipsky had yet to learn – escaped prematurely into the ether, much like the five-day Wallace-Lipsky “friendship” itself. Archetype: Hermit. Friend. Adversary. Depression.